Years ago, a small television production company canvassed various British broadcasters with an idea for a programme called The Million Pound Bake Off. The proposal involved filming a group of amateur bakers going through elimination rounds inside a marquee. For five long years, the owners of Love Productions, Anna Beattie and Richard McKerrow, found no takers. Eventually, the project was commissioned by the BBC’s documentary department, and in 2010, to mixed reviews, The Great British Bake Off was born. Six years later and it is a national institution, has broken ratings records and won a raft of awards. Most recently, and most controversially, it also changed channels – in a rumoured £75m deal. A clearly disappointed BBC is entitled to claim to have played an important role in the show’s undisputed success. It took the risk of commissioning a format nobody else showed interest in, and then nurtured the idea as if it was its own intellectual property. But the BBC has now lost one of its biggest shows to Channel 4. We may never know precisely what happened during protracted negotiations behind closed doors. However it seems likely the producers felt that their relationship with the public broadcaster had broken beyond repair to such an extent they felt forced to take it elsewhere. Formats, as the BBC’s former head of entertainment David Liddiment once put it to me, are “about creating moments with absolute certainty that something interesting will happen – and having the camera in the right place to capture it”. In a hit-driven industry, creating formats is a priceless skill, and it is inevitable that the most successful among them will change hands for hefty sums of money. But the Love Productions move is still unusual. The claim that it demonstrates the new power of producers is far fetched. The purchasing power of broadcasters with huge commissioning budgets – and there are few of them in the UK – put them firmly in the driving seat. Indeed, the BBC has been broadcasting other third party reality competitions without any problem for years, including Endemol Shine’s Masterchef and Mark Burnett Productions’ The Apprentice (co-produced by Talkback Thames in the UK). These large production companies know better than poking the bear, even with a long stick. Why risk damaging a long-term relationship with an important commissioner by haggling over the value of their fee? And having a format on a BBC channel is a great calling card to have at the market fairs, including the forthcoming Mipcom. One cannot help but feel sorry for the BBC in this saga but it knows perfectly well that a format can be a valuable piece of intellectual property. The corporation signed the world’s first TV format contract back in 1951 for a panel game show called What’s My Line? and owns Strictly Come Dancing, one of the world’s most desirable talent competitions. However, it will provide its management with a reminder about a fundamental principle of the business. The best intellectual property is the one you own and control. The public broadcaster must now hope that its new division, BBC Studios, will deliver it. Meanwhile, BBC executives who may have called Love Productions’ bluff, now appear to have (lightly beaten) egg on their faces. As for Love Productions, the financial rewards are great but so are the risks. 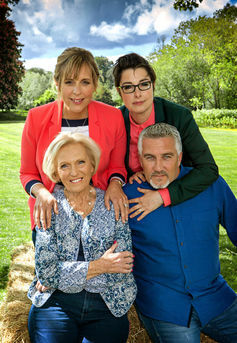 Will the format find its mojo on Channel 4 – especially now that Bake Off has lost its two presenters and Mary Berry, while only Paul Hollywood has opted to move channel? This raises the question of what made it so successful in the first place. Of course on-screen talent matters. Judges and presenters are the face of the format and viewers get attached to them. Mary Berry has become an icon. The chemistry between the judges enhanced the appeal of the show by adding a touch of intimacy. But GBBO’s recipe is not just about baking cakes, and the ingredients to its popularity are mostly hidden behind the screen. It is the programme’s engine (or set of rules) that creates the entwining stories and the gripping narrative arc. It is its structure (most notably the weekly elimination process) that creates the drama, the twists and the compelling contrast between the star baker and those whose dreams are shattered. It is also worth remembering that the best production companies are good at adapting their programme to the channel that commissioned it. A show that looks like a quintessentially BBC2 programme may equally be made to look like a quintessentially Channel 4 programme. As for Channel 4, this move is a sure sign it no longer fears a privatisation, because this acquisition doesn’t really square off with its remit for innovation and risk-taking. Bake Off may well fit quite snugly into a Channel 4 schedule which also features Come Dine with Me and various Jamie Oliver vehicles. The channel and Love Productions will also have more freedom to exploit the show’s commercial potential. But the move has already jarred with viewers, and Paul Hollywood, the one personality who has agreed to go to Channel 4, may be well advised to ask the contestants to add a spoonful of sugar to help the medicine go down. Jean Chalaby, Professor of Sociology, City, University of London. This article was originally published on The Conversation. Read the original article. How did the UK spearhead the world's TV format industry?